"We Won't Sell You A Car...We'll Help You Buy One!" Comments: Uconnect 5 inch touchscreen , Class IV Hitch Receiver, 20 inch Aluminum Wheels, SiriusXM, Remote Keyless Entry! Check out the large selection of new vehicles today! This red pearl 4X4 pickup has an automatic transmission and is powered by a 395HP 5.7L 8 Cylinder Engine. Our 1500 Classic's trim level is Express. This Ram 1500 Classic Express is a hard-working truck and a great value. It comes standard with stainless steel exhaust, aluminum wheels, fog lamps, an AM/FM radio with a USB port and an audio aux jack, air conditioning, a front armrest with three cup holders, heavy-duty shock absorbers, tow package with trailer sway control, and more. 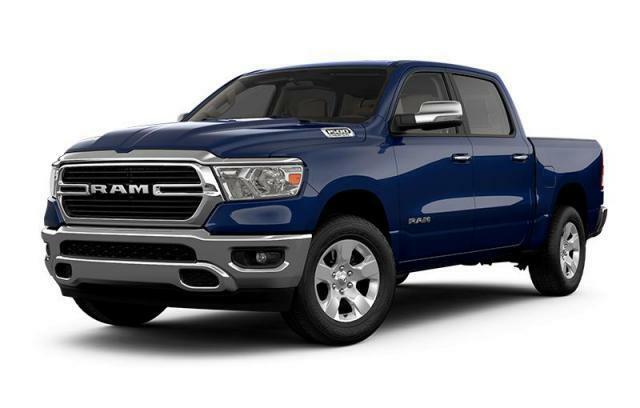 This vehicle has been upgraded with the following features: Uconnect 5 Inch Touchscreen , Class Iv Hitch Receiver, 20 Inch Aluminum Wheels, Siriusxm, Remote Keyless Entry, Sport Performance Hood, Engine: 5.7l Hemi Vvt V8 W/fuelsaver Mds. View the original window sticker for this vehicle with this url http://www.chrysler.com/hostd/windowsticker/getWindowStickerPdf.do?vin=1C6RR7FT7KS522971. We've discounted this vehicle $3106. Total rebate of $13420 is reflected in the price. Credit includes up to 25% of MSRP Discount. 4.29% financing for 96 months. Payments from $457.95 monthly with $0 down for 96 months @ 4.29% APR O.A.C. ( Plus applicable taxes - Plus applicable fees ). Incentives expire 2019-04-30. See dealer for details. *PRICING INCLUDES... Freight, Air Conditioning Tax, Tire Surcharge, Dealer Administration, Fuel Charge, NitroSafe/TireGuard, and O.M.V.I.C. Fee. Pricing excludes HST and License. IMPORTANT: THERE ARE MANY FACTORY INCENTIVES THAT MAY REDUCE THIS PRICE... PLEASE CALL US FOR DETAILS ON HOW MUCH YOU CAN SAVE. We understand that just because you are on our web site doesn't mean you are ready to purchase and you likely want to do your research and get more information before making a decision. Feel free to e-mail us by choosing one of the options in red at the right, but please check your junk or spam folder as sometimes filters send our responses there, we always respond to your request. Welcome to the bottom of the page, this is where all the fine print lives but more importantly, where we get to share with you, our appreciation for visiting us and for thinking of us in your search for a new or used vehicle, Thank you! *Prices represent the Manufacturer's Suggested Retail Price ("MSRP") minus current incentives and include air conditioning charge, freight ($1,795), OMVIC fee ($10), tire levy (where applicable), dealer-installed options, accessories, administration charges and other retailer charges and exclude taxes, license, insurance and other applicable fees. Incentive discounts may include Consumer Cash discounts, which are applied before taxes, and/or Bonus Cash discounts, which are applied after taxes. Please see your Rose City Chrysler sales representitive or visit Build and Price for further pricing information. Incentives may vary from time to time and may vary considerably by model, trim and engine option selected. All prices are in Canadian dollars (unless otherwise indicated). Although the intention is to capture current incentives and prices as of the date of publication, pricing is subject to change without notice, and may not be accurate or completely current. While every reasonable effort is made to ensure the accuracy of this data, we are not responsible for any errors or omissions contained on these pages. Please verify any information in question with a dealership sales representative. Information provided on this site does not constitute an offer or guarantee of available prices or financing. The estimated selling price that appears after calculating dealer offers is for informational purposes only. Certain conditions may apply for the offers, incentives, discounts, or financing. Offers, incentives, rebates, or financing are subject to expiration and other restrictions. Contact Rose City Chrysler 1-800-265-8130, to see if you qualify for any advertised offers. All product illustrations, prices and specifications are based upon current information at the time of programming. Although descriptions are believed correct, complete accuracy cannot be guaranteed. We reserve the right to make changes at any time, without notice or obligation, in the information contained on this site including and without limitation to prices, incentive programs, specifications, equipment, colours, materials, and to change or discontinue models. Images, pricing and options shown are examples, only, and may not reflect exact vehicle colour, trim, options, pricing or other specifications. Images shown may not necessarily represent identical vehicles in transit to the dealership. Contact Rose City Chrysler at 1-800-265-8130 or info@rosecitychrysler.com for actual price, payments and complete details. Prices in Ontario, Alberta and British Columbia represent the Manufacturer's Suggested Retail Price ("MSRP"") minus current incentives and include air conditioning charge, freight ($1,400-$1,595),($1,695 - $1,745) OMVIC/AMVIC fee, tire levy (where applicable), dealer-installed options, pre-delivery, administration charges and other retailer charges and exclude taxes, license, insurance and other applicable fees. Prices in Quebec represent the Manufacturer's Suggested Retail Price minus current incentives and include freight ($1,695 - $1,745). Prices in Quebec exclude only license, insurance, duties on new tires and taxes which will be required at time of purchase and may not include dealer-installed options and accessories. All prices are in Canadian dollars (unless otherwise indicated).